I picked up my new glasses, had a makeover in House of Fraser and went to the dentist for a check-up. 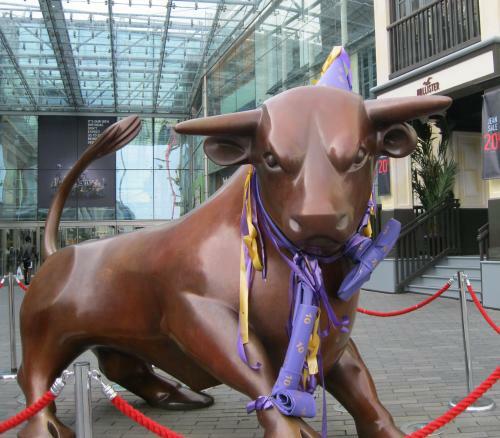 I’m not sure what happened to the bull at the Bullring, but he looked like he was getting over a hard night, and there was something he was less than happy with. Original Volunteers (OV) rang me in response to a voice message I left on Friday. I think the project coordinator answered whatever I’d called them for but I found a few more questions. In his email the project co-ordinator suggested that I would be expected to teach English and IT, also to engage in fundraising. English is fine. Not sure about the IT and fundraising is not my forte. I discussed with OV what I’d actually like to do, i.e. oral history, story-telling and writing workshops. They thought those things would be very much appreciated. So, I may well be writing stories for African children while I’m away, as well as getting them to write their own – and hopefully learning loads from them. On another note. I need to pick up a couple of locks for my suit cases because I’ve been advised that ‘things can get slotted out from cases without locks.’ Normally I don’t bother with locks, but as I’m taking gifts for the project I guess it’s probably best to take advice on this occasion. I’m hoping to have everything sorted by tomorrow so that I can relax a little before setting off. After all – I don’t want to arrive tired.